It seems at the moment that the mornings are grey and overcast but by midday the sun has broken through and we are treated to a glorious afternoon and evening. As the electric anchor windlass is currently broken, we had to lift the anchor by hand this morning. In fact, with two of us it wasn’t that bad. We wanted to round Cape Finisterre whilst we had good weather and little swell so we pressed on under motor as the winds were very light. It can be fairly treacherous in bad weather or with a big swell so we decided that today would be a good day to have another major headland behind us. Once around it the wind picked up and we had a lovely downwind sail with only the genoa (foresail) up and managing 6 knots. We are now in another anchorage called Muros which is very pretty and just outside the town. Not sure if we can be bothered to launch the dinghy and explore or just sit on the boat and chill! 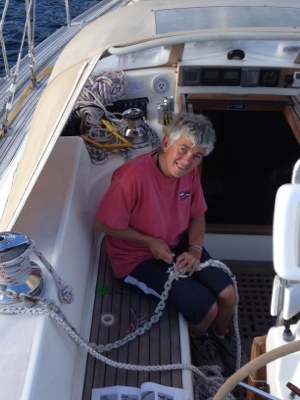 Having said that, Liz has decided to add some rope to our anchor chain so it is longer so we are neither chilling or exploring but at least she’s happy! !